Why Sprouts are good for the heart. Sprouts are the shoots of the plants which shoot up after germination. These tiny shoots have a bundle of nutrients and enzymes which are beneficial for our heart. The process of sprouting increases the Antioxidant content which helps to bind toxins and flush out from our system. The Fibre Rich Foods in them also help to get rid of the bad cholesterol (LDL) from our body and thus avoid clogged arteries and assure normal flow of blood to heart and all parts of the body. They are a rich source of essential fatty acids which again works towards improving Healthy Heart health. Sprouting in an inexpensive process though it calls for a little extra effort and a few minutes of preparation. Want to master the art of sprouting? Click here Sprouted and Boiled Moong to watch our video. 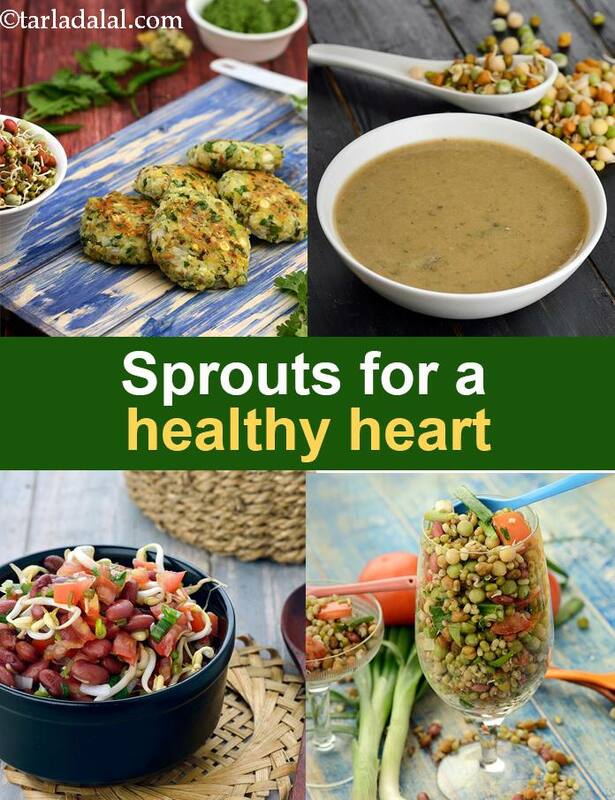 And if your inquisitive on how to include them in your diet – by combining it with healthy ingredients, start your journey with these Tarla Dalal recipes like Mixed Sprouts and Chana Dal Tikki, Moong Sprouts Panki, Mixed Sprouts and Mint Soup, Mixed Sprouts Chaat etc. Each of these scrumptious recipes have a nutritional fact table which will assist you note down the exact amount of energy, cholesterol, fat and other antioxidants you will obtain from them.